Credit cards may be king in the US of A, but cash rules everything around the world. There are foreign countries and places you’ll go that do not take credit cards, so always be prepared with local paper currency. It’s often cheaper to use cash because some places will add a fee if you want to pay with credit card. Taxi drivers from the airport, last minute trouble, whatever comes up, it’s always good to have physical money on hand. In a pinch, U.S. Dollars are usually accepted around the world if you find yourself in a jam. So keep a few of those in your wallet for a rainy day. However, it’s always better to have the local currency on hand. 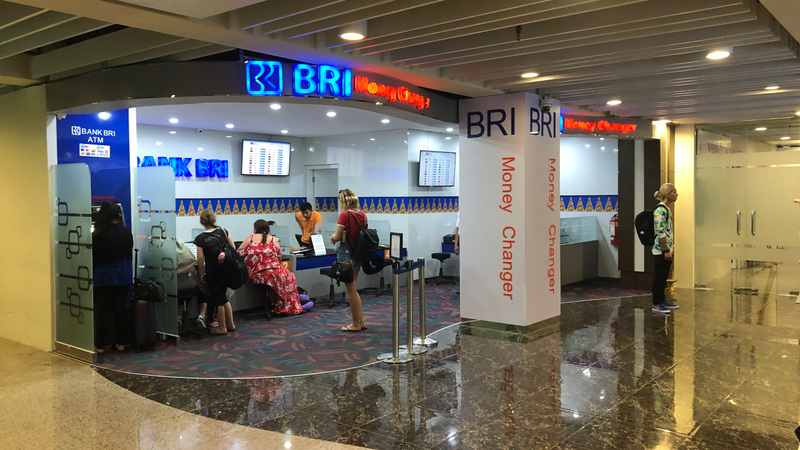 Foreign currency exchange and ATMs in Bali, Indonesia. 1. Get it before you depart in your home country USA? 2. 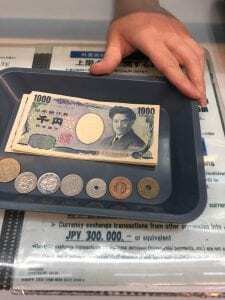 Should you exchange your USD for foreign currency upon arrival? 3. Or wait until your safely at your destination to use an ATM? Either way it’s imperative you travel with some hard currency just in case. This amount should include cash you can exchange if needed, as well as money you will keep safely in your possession for a last resort only. Your arrival time at the destination’s airport and your destination are the probably most important factors in deciding if you need to exchange money before hand. If you’re arriving real late in the evening, sometimes the foreign currency exchange counters are closed. If something goes wrong at the ATM, you could be outta luck. If you have US dollars, you’ll probably be fine enough, however, it’s definitely something to consider. Also paying someone local direct in U.S. dollars may result in a poor exchange rate. I’d consider 9pm or later a hard cut for foreign currency exchange kiosks at the airport, depending on location. Many are 24 hours, some are not. If that’s the case and you’re arriving late, bring some dollars, expect to use an ATM, and if you have an opportunity to, exchange a 100 dollars or so before you go. 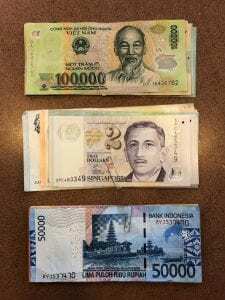 Foreign currency exchange in Bali. Problem: What’s the best way to exchange foreign currency? Hypothesis: ATM away from airport is the cheapest. Experiment: $100 USD Exchanging for Vietnam Dong, Singapore Dollar, Indonesia Rupiah. Triple A – same as Chase for rates, $200 minimum on any different currencies total, or an additional $10 charge. Free for members, or additional $10 charge for non members. Does not buy back foreign currency. Vietnam Dong, Singapore Dollar, and Indonesia Rupiah. Chase Bank – same as AAA, except no minimum amount and only available to bank members. Takes 2 days. Buy back currency at bad rates. Travel X – checked location in Boulder, Colorado, most expensive, buys back currency, bad rates. Conclusion – This is by far the worst option and it’s almost only good for throwing away your money. The one time I recommend it is if you will be arriving late in the night and prefer to have local currency ready to go. Otherwise you’ll always get a better exchange rate locally at your destination. If you absolutely have to exchange currency locally, your bank or Triple A will probably charge similar rates, except in this case, Triple A required a $200 minimum. You should, however, stop by Triple A for an International Drivers Permit, so you can ride in style and legally in many foreign countries! This way is actually not that bad, I just wanted to use a movie reference. Like ATMs, it will vary a little at each location. The absolute best thing is to shop around between tellers. 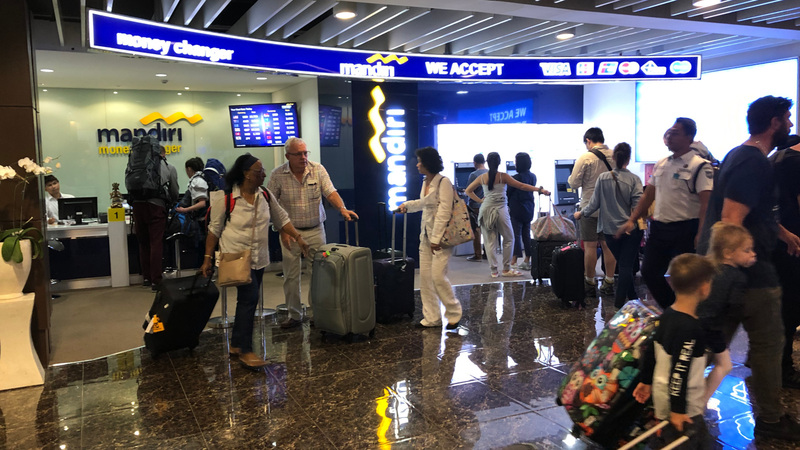 For example, in Ho Chi Minh City at Tan Son Nhat International Airport there are a handful of foreign currency kiosks each with a different exchange rate. Walk to each one and ask what 100$ USD gets you, then settle for the best one. No shame. Exchanging dollars for dollars in Singapore. Conclusion – This is a great option to explore and can be comparable to withdrawing from an ATM. It may even be cheaper if you decide to use an overpriced ATM at the airport, and your bank also charges you fees for using a foreign ATM. It’s important to shop around though. Depending on the location, you’ll probably be given a few kiosks to exchange currency, each with varying rates. Some may be same. Bali’s Ngurah Rai International Airport only had a couple choices that were the same rates. Whereas Saigon’s Tan Son Nhat International has a handful of choices, each with different rates. Since each ATM generally has different rates and fees, this one is up to you as a consumer. Know the fees (hopefully you have a bank that reimburse all ATM fees), view the exchange rate before you hit okay, and make a judgement call. In my experience ATMs at the airport were hit or miss, but usually always still higher than found in town, and similar to exchanging currency directly. However, once in town ATMs are the best way to go! Conclusion – Bring several hundred dollars in USA cash with you. Keep some safe for a rainy day emergency, and plan to exchange 100$ upon arrival. Then once you are in your foreign country, plan only to use an ATM. Find a bank’s ATM you like the best, and keep with it. Whatever you take out, check your bank account and see how much it costs you in USD$. Compare a couple banks if needed to find best one. Wealthy travels!